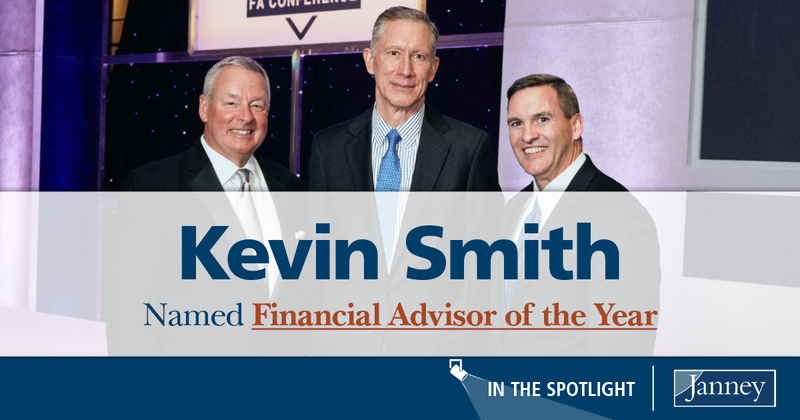 Congratulations to Janney’s Kevin Smith for being named Janney’s 2017 Financial Advisor of the Year! Smith, Executive Vice President / Wealth Management of the “Smith, Mayer & Liddle” wealth advisory group in York, PA, has worked diligently to ensure he is as educated as he can be to best help his clients. His passion for his profession is evidenced by his achievement of 12 professional designations and certifications, including CFA®, CFP®, ChFC®, CLU®, CAP®, CASL®, CRPC®, CLTC®, AWMA®, AAMS®, RICP®, and NSSA®. Such effort demonstrates not only his commitment to personal development, but also reflects his personal mission to make a meaningful difference in the lives of his clients through knowledgeable and compassionate holistic financial advice. Smith was presented with the FA of the Year Award at Janney’s ELITE Conference on January 11. This notable recognition is awarded annually to a Janney Financial Advisor who exhibits unsurpassed expertise in the field, a dedication to superior service, and an outstanding work ethic, demonstrated both in the office and in the community. In addition to recommending prudent investment strategies for his clients, Smith specializes in education, retirement and estate planning, and the development of solutions and strategies for the complex needs of corporate executives, business owners, and affluent individuals and their families. Smith left an established career as a corporate executive in 2001 to create his wealth advisory practice, which had always been his personal dream. Since he was a teenager, he knew that being a Financial Advisor was his calling. “I’ve always loved investing, financial planning, and helping people. Being a financial advisor combines these passions, and enables me to use my talents for the betterment of others,” Smith said. Smith and his partners joined Janney in February, 2009. Smith routinely gives back and shares his knowledge and expertise with his community. He is Vice President of the York County SPCA and a Board Member of Leave a Legacy York County. He is involved with the Stewartstown Lions Club, Family First Health, South Eastern Dollars for Scholars, South Eastern Community Education Foundation, and St. Joseph Church in various leadership and volunteer capacities. He also provides financial consulting and volunteers for his college alma mater, Gettysburg College, where he was class salutatorian and a Phi Beta Kappa graduate.